Pasque flower on a local prairie, announcing the birth of spring. Need I say more?, Of course I do. 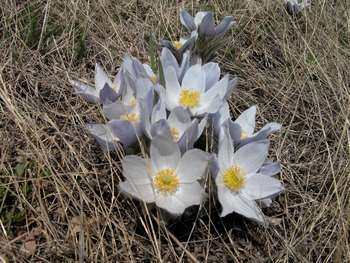 This diminutive but beautiful plant, which adorns dry prairies and oak savannas, often begins to emerge when snow can still be found in shaded areas, usually in April. As temperatures rise and soils begin to thaw, this plant begins to send up a group of deeply cut basal leaves which in turn give rise to a hairy stalk containing a single, white, blue or purplish flower. This has been a long winter. Dont get me wrong, I like winter between December 1st and March 20th. After that, though, I am looking for a sign  an affirmation that life is still there. The pasque flower does that for me. If you find one and a smile doesnt immediately take over your entire face, call me and I will give you your money back, no questions asked.